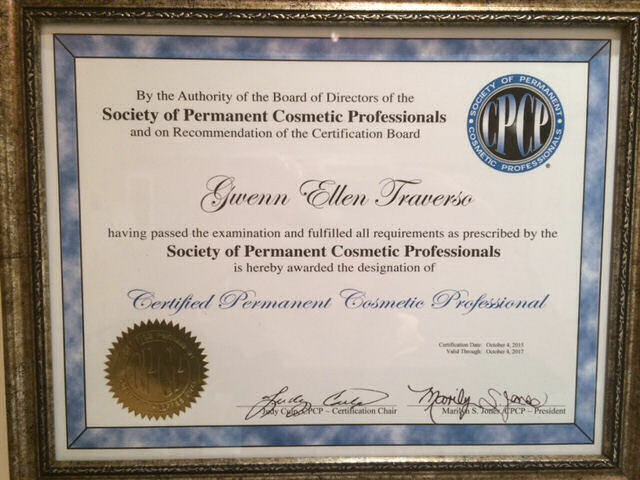 Gwenn Traverso has earned the prestigious title of Certified Permanent Cosmetic Professional (CPCP). 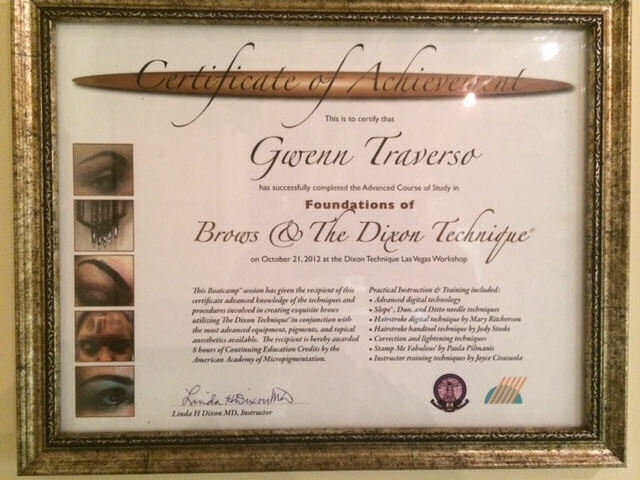 Gwenn Traverso is known by her clients for excellent designs, color choice along with very skillful application. Eyebrows frame the eyes giving expression to our face as a whole. They make subtle but dramatic differences in our whole demeanor, communicating, and strengthening our expression of emotion. 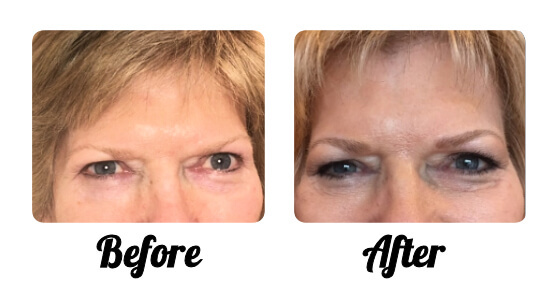 Permanent makeup artists recreate them by implanting pigment to enhance, define, and to restore what was lost due to plucking, aging and fading. 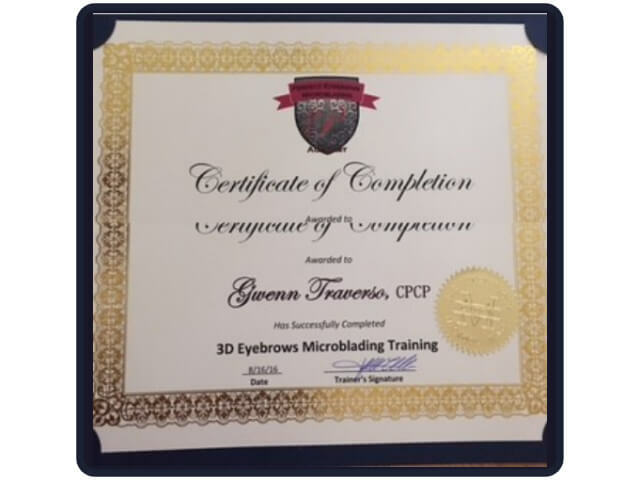 3D Eyebrow Mircoblading (or eyebrow embroidery) is a relatively new, manual method. 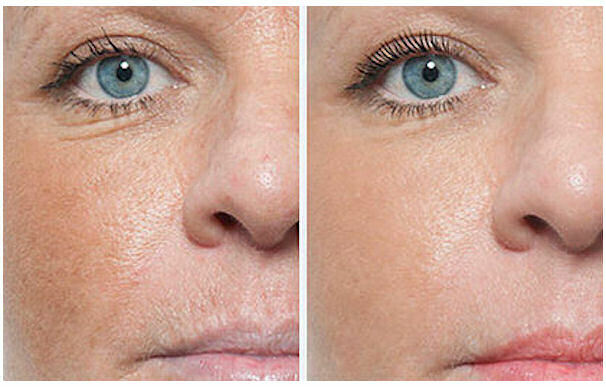 The results vary and last 1-4 years, depending on the client’s maintenance and skin type. 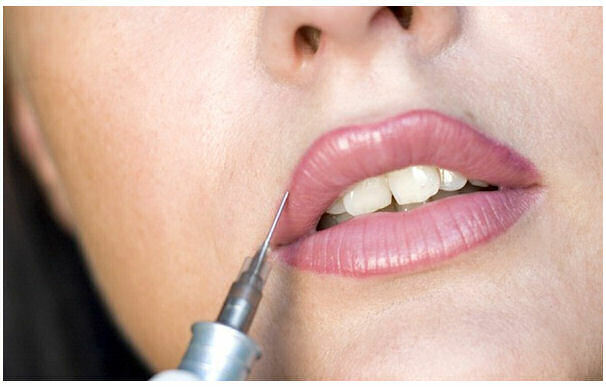 One touch up 3-4 weeks after the initial procedure is included and highly recommended. Thereafter another touchup (charged separately) is recommended 12-18 months later in order to retain the natural shape and color. 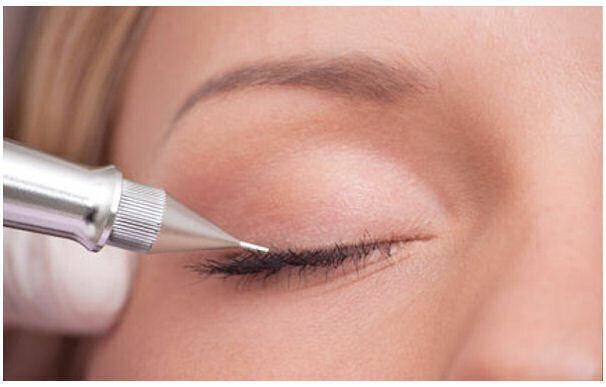 With the Microblading Technique, a very fine needle is used to deposit pigments into the dermis. The stroke replicate the natural hairline. 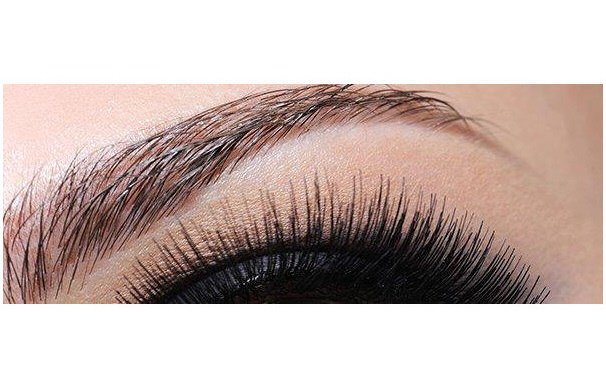 The results are natural looking, hair-line strokes, regardless of the amount of natural brow hairs the client has present. 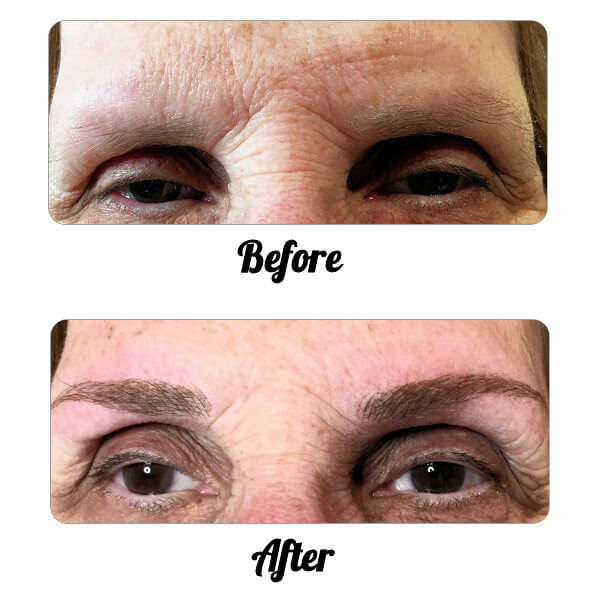 People suffering from Alopecia, trigonometrical or any other condition that causes hair loss benefit greatly from Microblading, as well as people who simply aren’t happy with their eyebrows. The powder fill technique of cosmetic tattooing typically lasts longer than the 3D hair stroke style. This is because the needle used in powder fill brows goes deeper into the skin than it does with 3D hair strokes. If you are looking for a longer-term eyebrow, powder fill brows may be the best option for you. 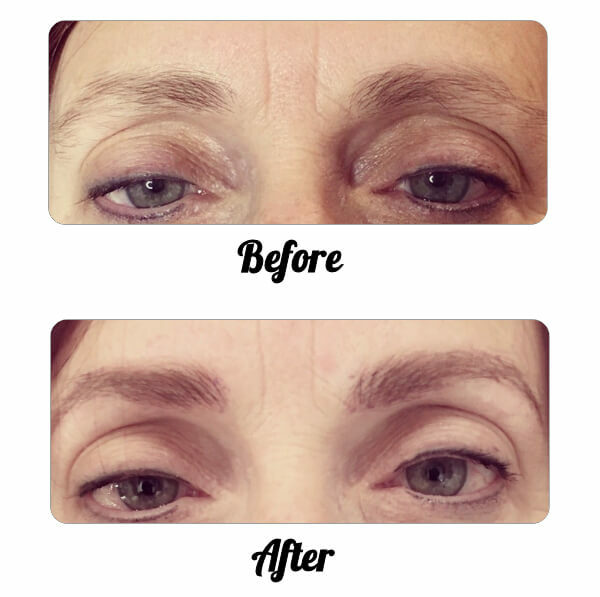 Powder fill brows may also be a better option for more mature patients, as the hair stroke method tends to fade faster. The powder fill method goes deeper using small dots of pigment, gradually built up to look like natural eyebrows. This method has a very defined shape, but does not have to look blocky or heavy when done correctly. 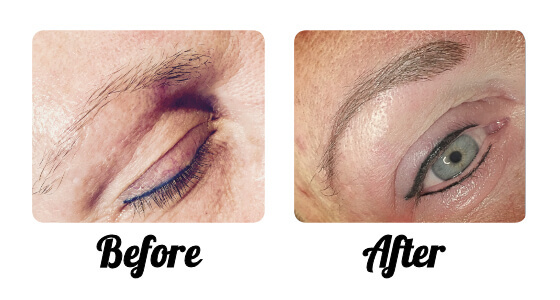 A pigment is implanted to create an enhancement within the lashline and/or full eyeliner above the lashline. 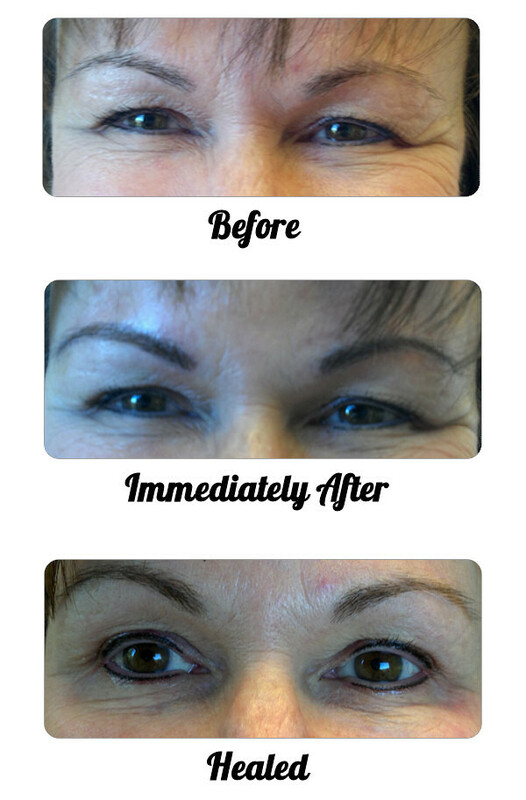 Permanent eyeliner is beneficial and safe! It will not run, smear or smudge and a great answer for those having trouble applying makeup due to poor vision, skill, or allergies. Implanting pigment colors to enhance, define, and restore color. It solves the problem of lipstick bleeding into vertical lines. 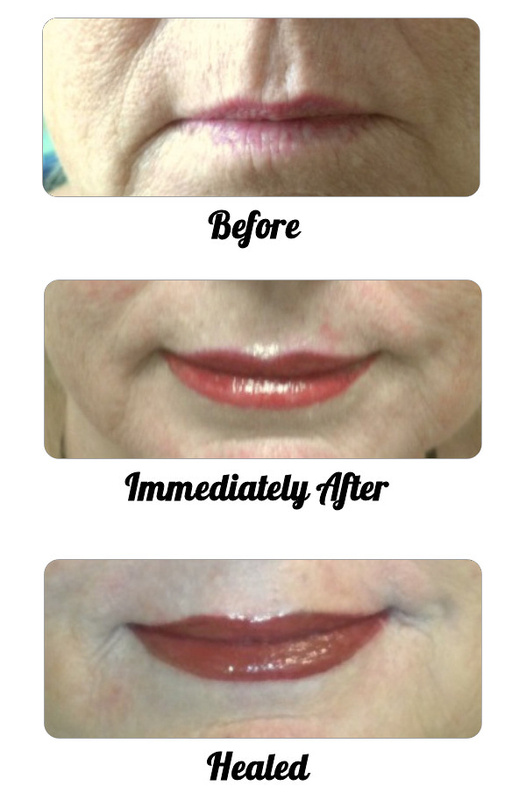 The process also stimulates collagen production to increase volume, hence, plumping lips! Please note: Anyone who has ever had a cold sore at anytime during their lifetime is required to premedicate with an antiviral such as Acyclovir or Valtrex at least 24 hours prior to the procedure and continuing 3-4 days after. A prescription must be obtained from a physician. 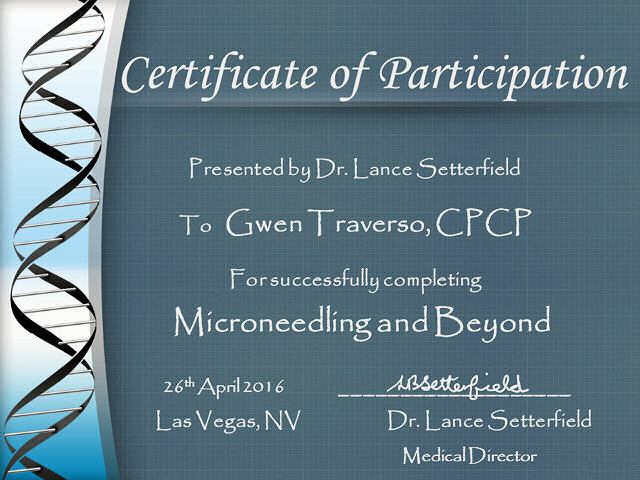 Micro Needling is proven to be effective at reducing fine lines and wrinkles, acne scarring, and hyperpigmentation. 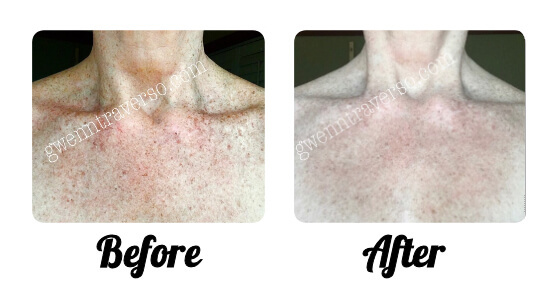 It is cost-effective and can be done on areas not suitable for peeling and laser resurfacing. Such as around: the eyes, mouth, hands and chest. 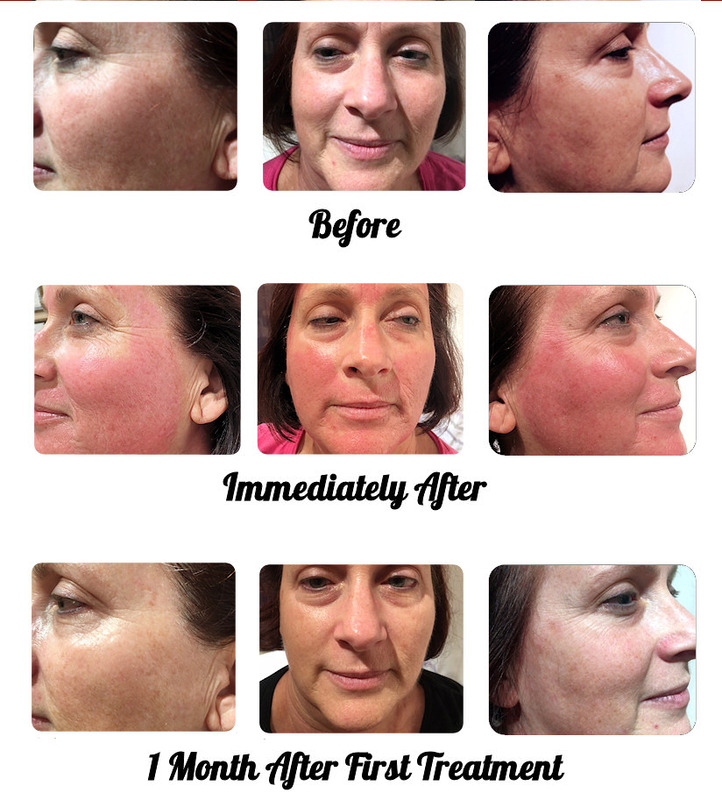 This procedure is well tolerated with minimal downtime, and can be personalized to meet your specific needs. 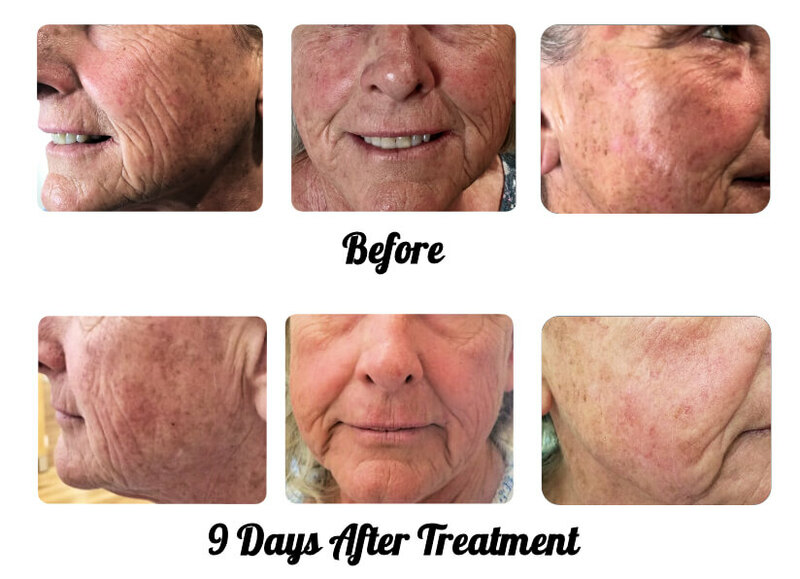 Also known as collagen induction therapy (CIT), is a minimally invasive procedure that involves the use of a small needles to puncture the skin creating a controlled injury. Every puncture creates a microscopic channel that triggers the body to respond with increased collagen and elastin production. 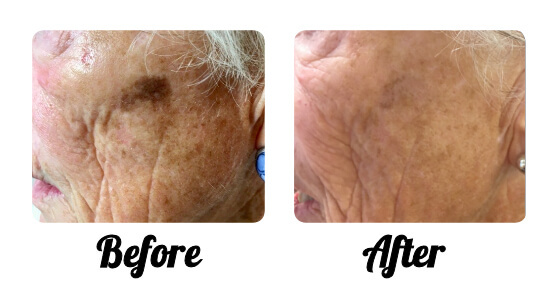 This process improves texture and firmness, as well as reducing scar tissue, pore size, and stretch marks. It’s my passion to help women gain a greater sense of confidence and freedom in themselves. This is what has kept me honing my art for the last 12 years. 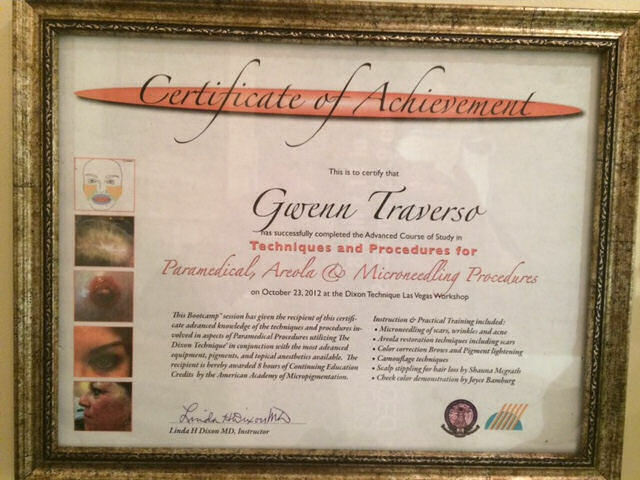 I have been performing permanent cosmetic procedures since 2004. My skill and artistry has come through experience and education. My goal is to give my clients a positive experience that will leave them knowing…. in a deeper way, that True beauty is more than skin deep. 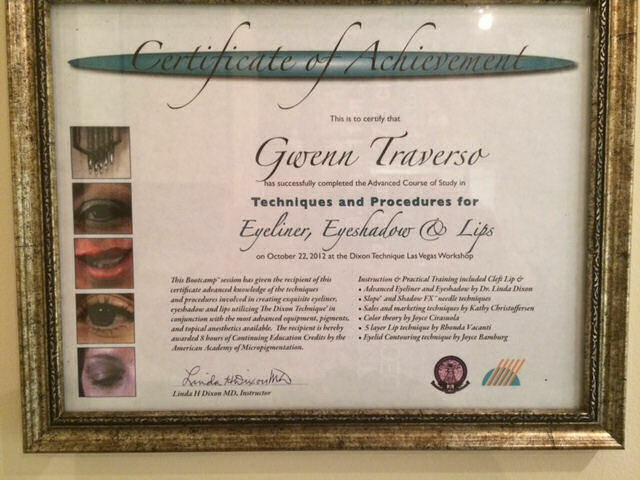 Gwenn Traverso began her Permanent Makeup education in 2004 and began working from her home based studio shortly afterwards. 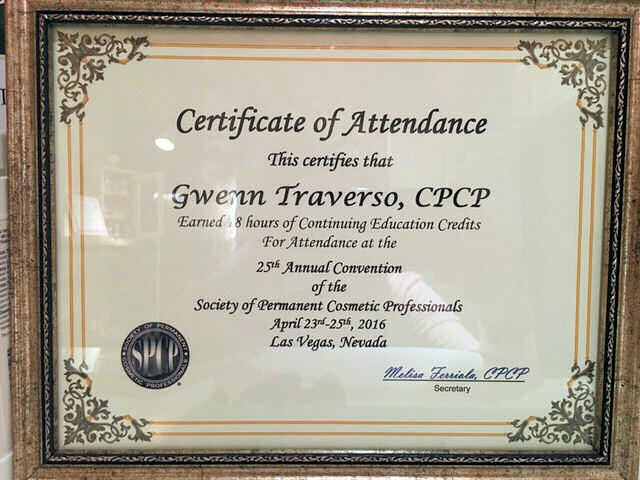 Keen to continue furthering her knowledge and skill, Gwenn Traverso regularly attended classes, conferences and conventions. 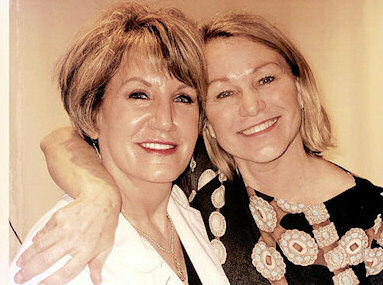 She eventually shared an office with Dermatology and Internal Medicine practice where she also worked as a nurse. Most recently she opened up her own private studio in beautiful down-town St. Helena. 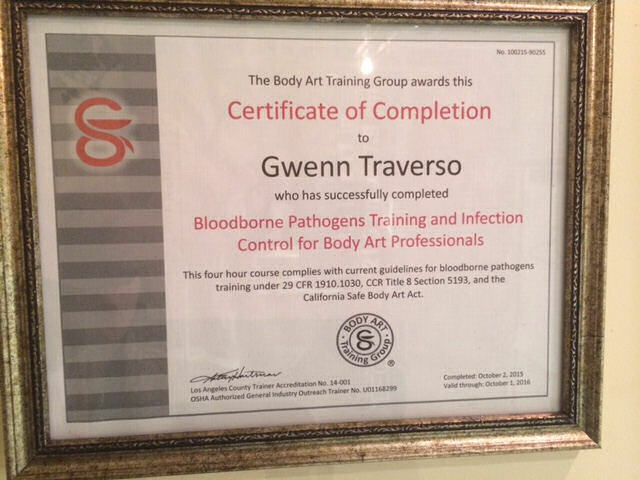 Gwenn Traverso maintains her annual certification in Blood Borne Pathogens (BBP) safe practices and has met all State, County and local regulations. Got a question for Gwenn? … since having my eyebrows done. I like glancing in the mirror and knowing that I look at least 10 years younger constantly! 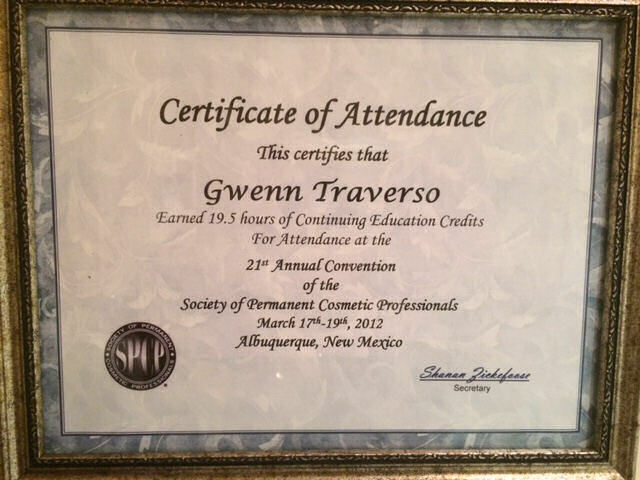 – I had my eyeliner done by Gwenn 10 years ago and just had it done again! 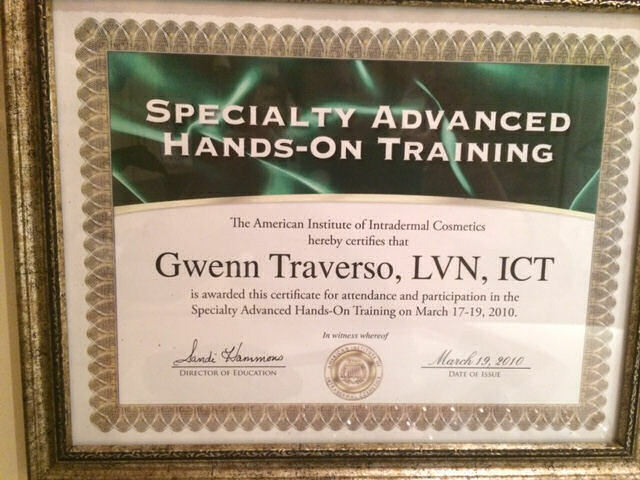 Gwenn is a nurse and does wonderful work! 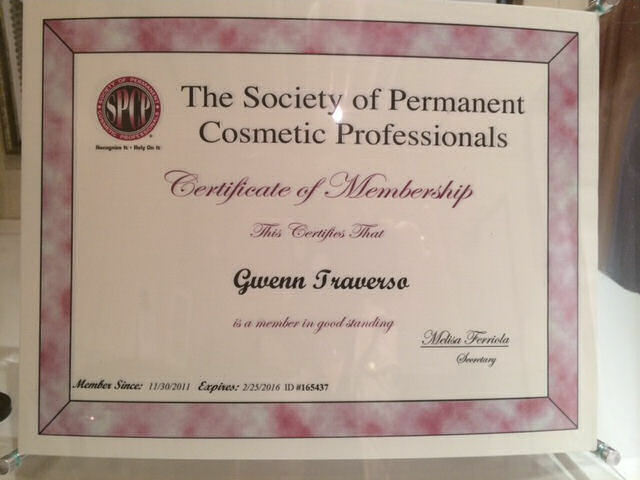 I would highly recommend her if you are thinking about permanent makeup. 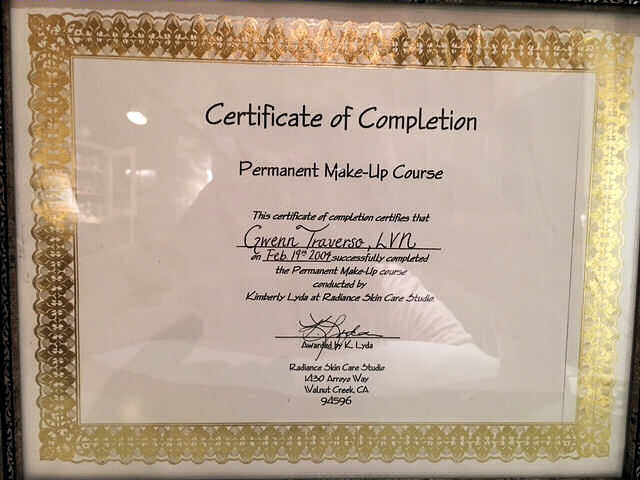 … engaging in services with an artist, who is a professional and provides excellence within her field of tattooing-eyebrows! 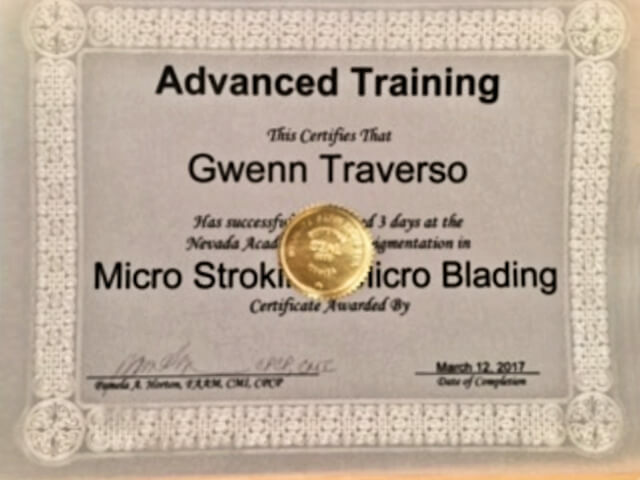 Gwenn is a perfectionist – a true “artist” as well as “medically sound and safe”. She is a licensed professional who makes you feel comfortable while working with you for a look that “fits” your personality – and what you want. My eyebrows look natural and more importantly, even, yet not overdone. I’m very pleased with her work and would highly recommend her and her professional services. Next stop for me? 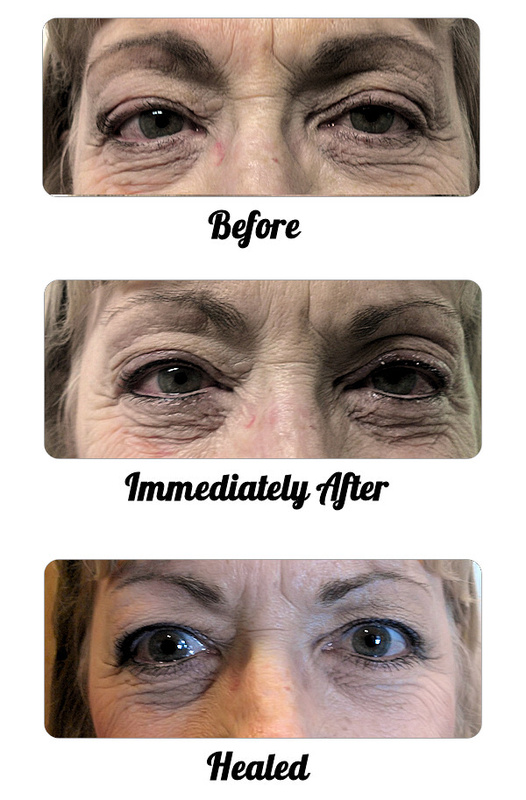 Permanent eyeliner! 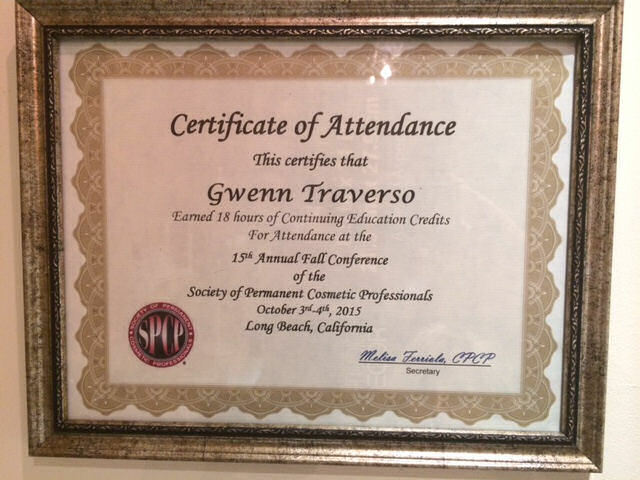 Thank you Gwenn! I met Gwenn years ago. 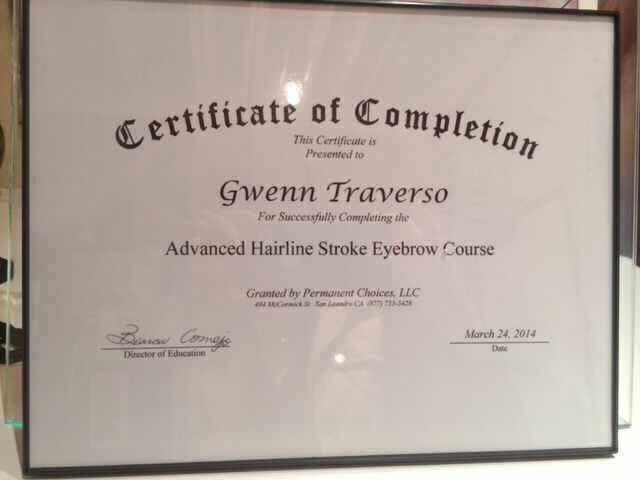 We talked about permanent makeup for my eyebrows, it scared me to pieces. What if I hated it??? As I aged my eyebrows had no color, I felt like I looked 30 years older than I am. I contacted Gwenn! Long story short-I am beyond thrilled! It seems to lift my face and I feel I look dramatically younger! I can go outside my door in glee! With or without the rest of my makeup on! Gwenn also is helping eliminate a very large dark sun spot on the side of my cheek. It’s amazing! I can’t say enough wonderful things about her work and she as a person is a total delight. Requesting your first appointment is easy. So is asking me a question about any of the procedures I offer. When you're ready, call or send me a message with your contact details and your enquiry. I'll then be in touch as soon as possible to answer your questions and discuss a convenient date for your first consultation. Please note ~ All visits & procedures are strictly by appointment only.